An everyday productivity suite for your business to help you manage your work seamlessly from any internet-enabled device. G Suite by Google Cloud is a highly collaborative yet easily accessible tool that drives any business irrespective of its enterprise size. 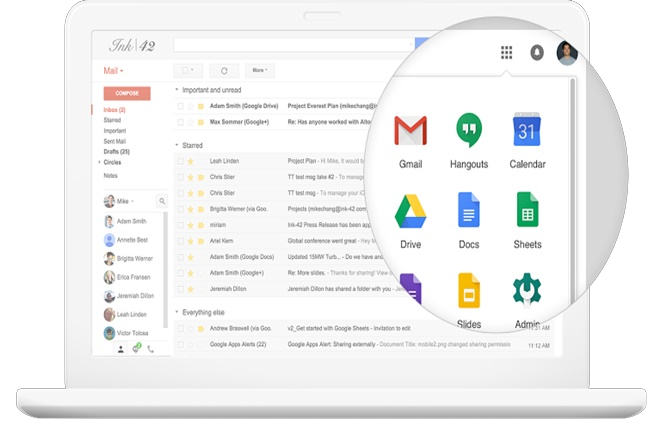 You can customize your business emails, calendar, mobile emails and IM access using G Suite. With 99.95% guaranteed uptime and 24x7x365 email and phone support, G Suite setup is available for small enterprises, educational, government and non-profit organizations. G Suite understands the significance of your data. It ensures the safety of your data by keeping a data backup and providing a recovery option required anytime. With the motto of go green, helps the environment by reducing the expenses of papers and their adversities on the environment when not recycled properly. G Suite enables the users to access emails, calendars, and documents distantly from Internet-enabled devices with an objective to save their work on the cloud. Making the invoices and budget reports easily accessible and shareable among employees with just a few clicks. Calendar alerts for company meetings, employee’s birthday and other prominent events so that nothing goes missing. G Suite allows everyone to work together, be it partners or clients, by facilitating the provision to create and edit online documents, spreadsheets, presentation, and files. To help your organization grow, G Suite offers customized web address for your company and customized emails for your employees. Google offers various G Suite editions, such as G Suite for Teams, G Suite – Basic & Business, and G Suite Enterprises where every edition has its own administrative capabilities. G Suite for Teams: This edition allows the user to use the core collaborative capabilities of G Suite along with an already deployed email and calendar solution. G Suite – Basic & Business: The basic and business editions are available with slight variations in their cost models, storage, and compliances. G Suite Enterprises: As the name suggests, the Enterprise edition is for larger organizations with unlimited storage and includes advanced functionalities such as enterprise-grade meetings, security key management, and data loss protection. Why choose i2k2 for G Suite? i2k2 Networks is a registered partner of G Suite and helps enterprises to configure and manage their day-to-day business activities through G Suite applications. With an unmatched support for data security, software update, file documentation and numerous clerical works, i2k2 Networks promise to deliver best-in-class services round-the-clock. Explore the possibilities of G Suite that helps grow your business and boosts your productivity across the globe! Connect with our G Suite expert at +91-120-466-3031 | +91-971-177-4040 and help us know your requirements better.